Continuing the exponential increase in scientific and medical breakthroughs directly depends on our commitment to teaching the next generation of independent researchers. Our department is dedicated to providing cutting-edge research experiences and first-rate didactic training to students at the high school, undergraduate, and graduate levels, through both internal, intra- and inter-institutional programs to train our students in the rapidly evolving and highly interdisciplinary field of computational biology. 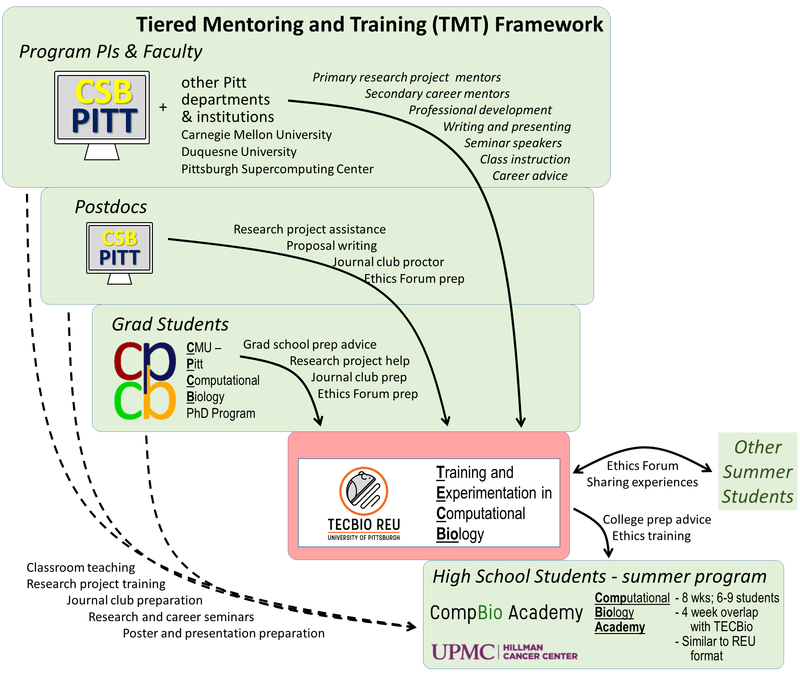 Our department has implemented a Tiered Mentoring and Training (TMT) framework, which provides students with numerous opportunities to learn from multiple faculty, postdoctoral fellows, graduate students, and other summer undergraduates from a variety of areas and perspectives. These interactions also provide important professional development opportunities for these early-stage and nascent investigators, who will be future teachers and mentors (see poster).